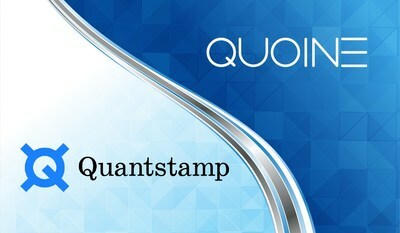 TOKYO, Feb. 6, 2018 — QUOINE, a leading global cryptocurrency fintech company, announced today that they signed an MOU with Quantstamp Inc. intended to enhance the smart contract security of select projects conducting their ICO on QUOINE's ICO listing and crypto-to-crypto trading and exchange platform, QRYPTOS. QUOINE is a fintech company that aims to democratize finance by providing more liquidity to the crypto economy and spreading premium financial services to everyone around the world. QUOINE partners have over 250 years of combined fintech experience and the team at QUOINE is comprised of banking and finance veterans from global top tier investment banks including Goldman Sachs, Credit Suisse and Merrill Lynch and global venture capital fund SoftBank Group. In early November, 2017, QUOINE raised 350 million QASH (the equivalent of 350,000 ETH or over 280 million USD) in their oversubscribed token sale. The QASH Token Sale had 4,988 participants from 98 countries around the world, making it one of the most successful blockchain fintech token sales globally. Quantstamp Inc. is developing a security protocol that audits smart contracts using formal verification techniques to find vulnerabilities before they are published to the blockchain. Quantstamp is designing its audits to be secured and verified by a distributed network of nodes, much like an Ethereum node secures and validates an Ethereum transaction. This model is intended to make the Quantstamp protocol a scalable and cost-effective solution to the smart contract crisis. Currently, over 256 million USD&nbsp;in Ether were either lost or stolen due to faulty smart contracts. The MOU lays the groundwork allowing for Quantstamp to provide security recommendations for select smart contract projects on the QRYPTOS platform. QRYPTOS manages the token sale process on behalf of a token issuer. This management attempts to streamline the token sale process for token issuers, enhance security measures and provide a safe participation process for the crypto community. After a token sale is conducted on QRYPTOS, the token is immediately tradable on its platform. In an effort to further protect QRYPTOS users, Quantstamp will act as QUOINE's smart contract security advisor on select projects. Quantstamp's recommendations are meant to enhance the smart contract security practices of token issuers managing their ICO through QRYPTOS.